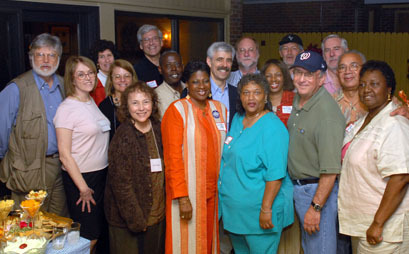 In April, 2006, journalists who had worked on the Courier gathered in Montgomery, Alabama, for a reunion. 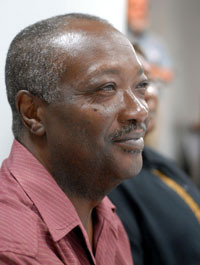 For many, it was the first time they had returned to the state since the 1960s. The Montgomery Advertiser and the Harvard Crimson (the training ground for the Courier's founders, editors, and several of its reporters) both covered the event. The Harvard Crimson. Hope Alongside Hatred: The staff of a civil rights newspaper, started by two Harvard juniors, returns to Alabama. By Stephen M. Fee. "The Courier offered Alabama’s disenfranchised black community a voice that any paper worth its salt ought to offer, but that only the Courier provided. Now, 41 years after their first issue, the staff is back in Montgomery, ready to talk about their accomplishments. But they’re also ready to talk about the unclear legacy they’ve left behind in Alabama, where the story of the civil rights movement has yet to conclude." Montgomery Advertiser. The courage of the Courier: Event to mark 40th anniversary. By Erica Pippins. "During some of most turbulent days in the nation's history, many Southern papers shied away from covering anything associated with the civil rights struggle. Enter the Southern Courier." Montgomery Advertiser. 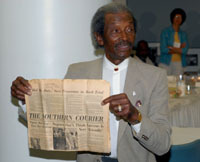 'Southern Courier' staff members enjoy garden party. By Deborah Hayes Moore. 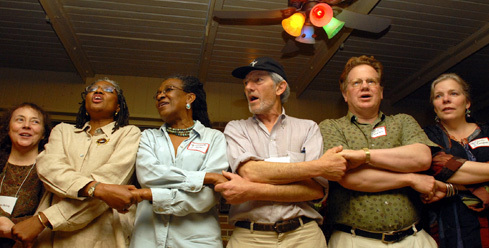 "Laughter and shared memories were the hallmarks of the evening, which culminated in the singing of old Freedom songs . . ."